DNC crowd goes wild with click-clackers at a hotel in Washington. 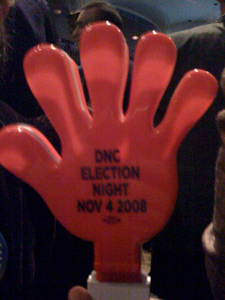 This is the plastic, two-sided hand clicker that partygoers at the DNC's celebration at the Mayflower Hotel tonight shook excitedly every time the networks announced another state for Barack Obama. When everyone in the room was revved up, the collective effect of all that click-clacking was rather impressive.